Geocaching is an international phenomenon and one of the most popular and fastest growing outdoor games in history. Geocaching combines GPS technology, a quest and the great outdoors. The goal of geocaching is to locate ‘hidden treasure’ using latitude / longitude coordinates as the main clue on where to find the treasure. The coordinates are available on the internet www.geocaching.com or from the DOWNLOAD section on this website (e.g. look for the ‘Way-finder Cache Trail’ document). Go to our online shop to buy your Geocache starter kit with the coordinates. The ‘treasure’ is generally something of token value – key rings, novelty toys or small mementos – usually concealed in a lunchbox, tobacco tin, film canister, etc called a cache. The most essential items for geocaching are a handheld GPS and a list of cache coordinates. Using a handheld GPS with the coordinates loaded into it, travellers search in hope of finding a cache and then replace it exactly where they found it after replacing one of the trinkets with one of their own and/or leaving a note in the logbook inside the cache. Enthusiast geocachers can register at www.geocaching.com and then record all their ‘finds’ on the website to show others how active they are in playing the game. The 35 caches on the Outback Way-Finder Trail are located at sites of natural, cultural, historic or scientific interest. All the coordinates and descriptions are listed on the website (www.geocaching.com). 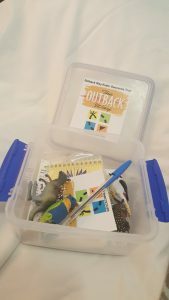 The caches used along the Outback Way-Finder Trail are a sandwich-sized lunch box large enough to hold a small notebook, a pen and a few trinkets. So what are you waiting for, load the coordinates into a handheld GPS and start the world’s greatest and longest treasure hunt from Laverton or Winton! You’ll be absolutely amazed at what you see, do and experience along the Outback Way-Finder Geocache Trail.